Here are some snazzy birthday facts about 9th of February 1980 that no one tells you about. Don’t wait a minute longer and jump in using the content links below. Average read time of 10 minutes. Enjoy! What day was my birthday Feb 9, 1980? February 9, 1980 was a Saturday and it was the 40th day of the year 1980. It was the 6th Saturday of that year. The next time you can reuse your old 1980 calendar will be in 2036. Both calendars will be exactly the same! This is assuming you are not interested in the dates for Easter and other irregular holidays that are based on a lunisolar calendar. There are 294 days left before your next birthday. You will be 40 years old when that day comes. There have been 14,316 days from the day you were born up to today. If you’ve been sleeping 8 hours daily since birth, then you have slept a total of 4,772 days or 13.07 years. You spent 33% of your life sleeping. Since night and day always follow each other, there were precisely 485 full moons after you were born up to this day. How many of them did you see? The next full moon that you can see will be on May 18 at 21:13:00 GMT – Saturday. Fun stat: Your first one billion seconds (1,000,000,000) happened sometime on October 18, 2011. If a dog named Shuaishuai - a Xoloitzcuintli breed, was born on the same date as you then it will be 195 dog years old today. A dog’s first human year is equal to 15 dog years. Dogs age differently depending on breed and size. When you reach the age of 6 Shuaishuai will be 42 dog years old. From that point forward a medium-sized dog like Shuaishuai will age 4.5 dog years for every human year. Gregory XV becomes Pope, the last Pope elected by acclamation. The Balkan Entente is formed. World War II: A force of Allied aircraft unsuccessfully attacked a German destroyer in Førdefjorden, Norway. Second Red Scare: US Senator Joseph McCarthy accuses the United States Department of State of being filled with Communists. Halley’s Comet last appeared in the inner Solar System. A 6.9 magnitude earthquake strikes southwest Colombia causing major disruption to the region and injuring at least 15 people. What does my birthday February 9, 1980 mean? Your birthday numbers 2, 9, and 1980 reveal that your Life Path number is 2. It represents balance, harmony and partnership. You have the soul of an artist. You are a fine companion and possess a good sense of humor. Friends seek you out for your calming and peaceful company. The following celebrities also have the same life path number: George Claydon, Noah Taylor, Chris Frantz, Vesna Pisarović, Hayato Tani, Kelly van der Veer, Xiao Xun, Katya Shchekina, Delbert McClinton, Adrienne Frantz. 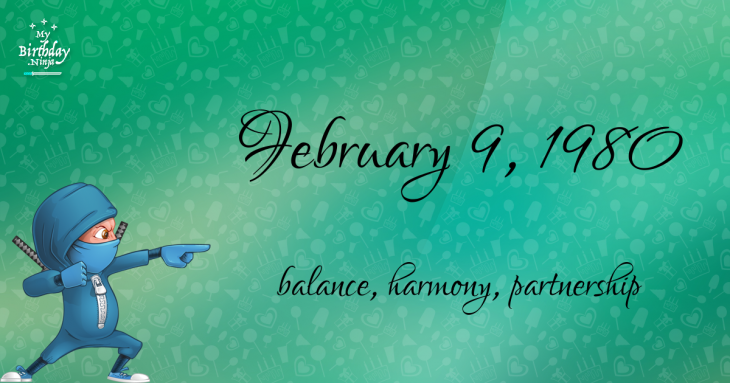 What is the birthday horoscope for Feb 9, 1980? The Western zodiac or sun sign of a person born on February 9 is Aquarius ♒ (The Water-bearer) – a fixed sign with Air as Western element. The ruling planet is Uranus – the planet of originality. According to the ancient art of Chinese astrology (or Eastern zodiac), Sheep is the mythical animal and Earth is the Eastern element of a person born on February 9, 1980. Fun fact: The birth flower for 9th February 1980 is Violet for modesty. What is the Love Match for Feb 9, 1980? When it comes to love and relationship, you are most compatible with a person born on November 1, 1954. You have a Love Match compatibility score of +117. Imagine being in love with your soul mate. On the negative side, you are most incompatible with a person born on May 17, 2000. Your incompatibility score is -144. You’ll be like a cat and a dog on a love-hate relationship. Arf-arf, I want to bite you. Meow-meow, stay away from me! The number-one hit song in the U.S. at the day of your birth was Rock with You by Michael Jackson as compiled by Billboard Hot 100 (February 9, 1980). Ask your parents if they know this popular song. I do not know how you feel about this, but you were a male ♂ in your last earthly incarnation. You were born somewhere around the territory of Southern China approximately on 1375. Your profession was trainer, holder of the fine animals, birds, insects. How many babies were born on February 9, 1980? Base on the data published by the United Nations Population Division, an estimated 125,148,676 babies were born throughout the world in the year 1980. The estimated number of babies born on 9th February 1980 is 341,936. That’s equivalent to 237 babies every minute. Try to imagine if all of them are crying at the same time. What is the popular baby name on 9 Feb 1980? Here’s a quick list of all the fun birthday facts about February 9, 1980. Celebrities, famous birthdays, historical events, and past life were excluded. 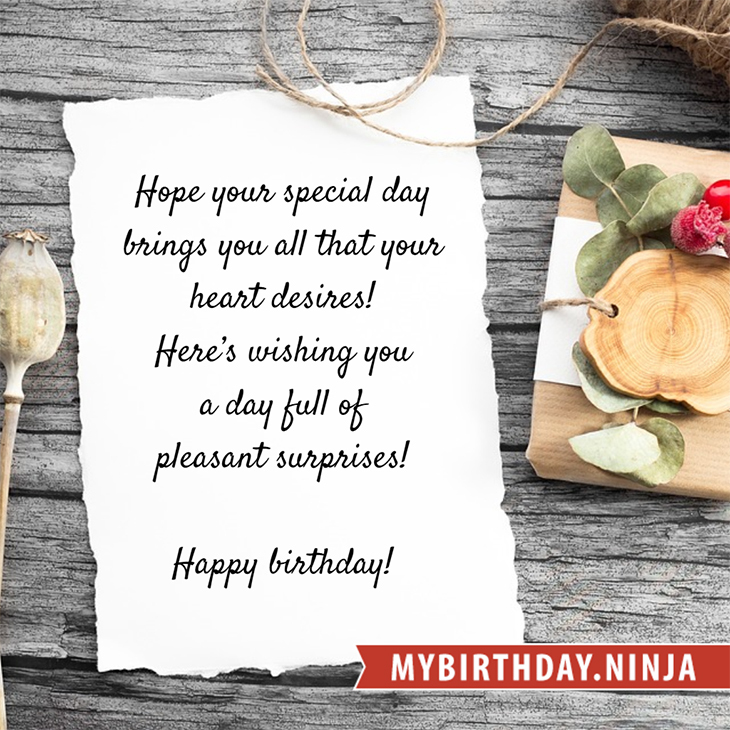 Try another birth date of someone you know or try the birthday of these celebrities: October 20, 1993 – Hunter King, American actress; April 30, 1975 – Johnny Galecki, Belgian-American actor and producer; June 29, 1972 – Nawal Al Zoghbi, Lebanese singer.